The first sign of spring has emboldened me to tell winter not to get too cozy; your days are numbered. For weeks, she’s plopped her moody self outside my window and ignored my request to keep her distance. But just yesterday, as I was avoiding her contagious cough of cabin fever, I discovered snowdrops and crocuses peering up through the dried leaves of last autumn. The petaled harbingers of spring were signaling the final days of her reign and telling me to keep the faith. The last couple weeks have been tough as witnessed in my slovenly attitude toward daily maintenance. Failure to shave is the first sign; it’s my canary in the coal mine. When my thinning head of hair becomes an uncombed fright wig, and my favorite sweater and jeans garner uniform status, I know I’m in trouble. Stacks of seed catalogs litter any and every surface–dogeared, creased and doodled on for days. Dirty clothes have infiltrated my clean laundry, the new layer mocking me for my propensity to pile not fold. The dishwasher has become a plate and cutlery storage unit while blackberry brambles slowly tangle my garden like rhizomatic rebar. Boz and Gracie seem to be immune, paying little attention to anything other than treats and wood-stove proximity. That is about to change. I’m ready for spring. I ready for an attitude change. I ready to get a move-on. And in honoring my escape from cerebral and physical hibernation, and in extending my hand to winter (no hard feelings), I offer up my gallery of goodbyes, a few highlights that got me through the dark days of winter. 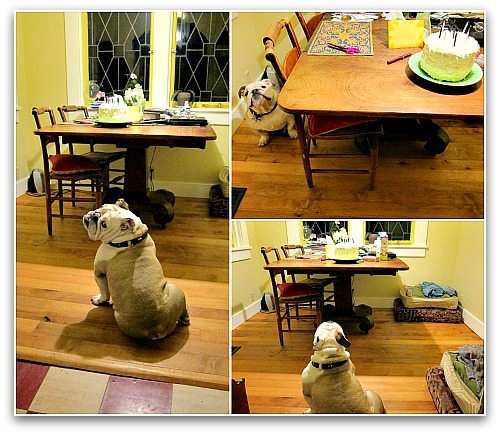 While I celebrated a birthday, Boz celebrated the possibility of toppled tables and coconut cake crumbs. 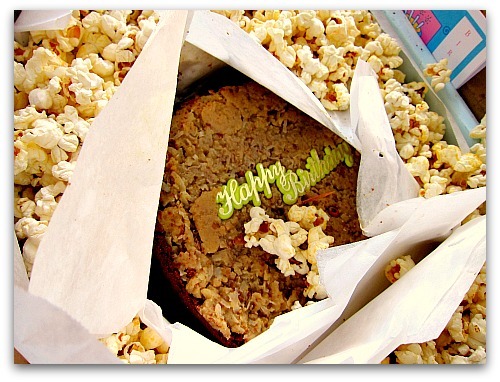 Wrapped in parchment paper, protected by real popcorn, a surprise from-scratch German Chocolate Birthday Cake arrived in the mail from my amazingly considerate mother (Decadent, and not a crumb out of place). 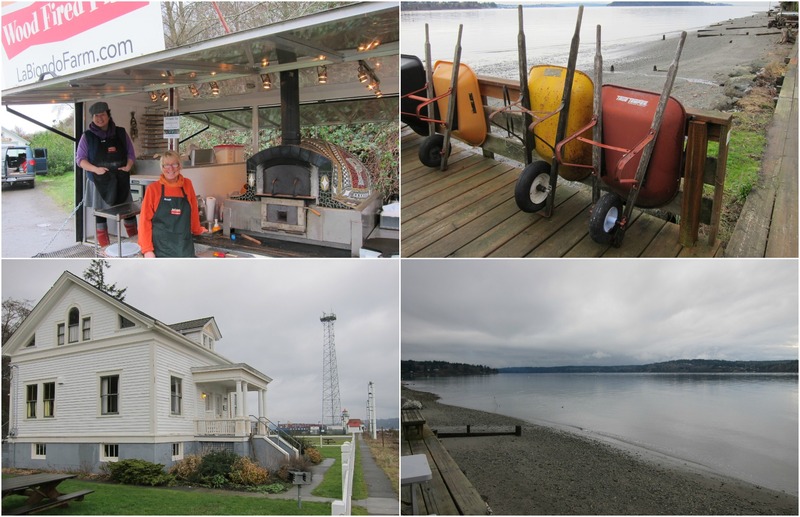 Sponsored by the Vashon Chamber of Commerce, I enjoyed a tour of the island’s guest house rentals, along with a couple wedge’s of Vashon’s best pizza. (photos: La Biondo Pizza, wheelbarrows for walk-in residents, Sylvan Beach, and Point Robinson Lighthouse quarters (for rent). Ten days of fog made me appreciate our normal rain patterns. Stylish dog beds there in the dining room,love your beautiful windows and the color in the bathroom reno is perfect. Is that your bathroom? It’s gorgeous! Well, say what you will about spring but I have yet to see the big pile of snow on my garden to disappear! I expect I will be out with a shovel to remove it so the garden soil will warm a little earlier. I am soooo tired of snow this year. I’ve been popping by to read your blog for a few months now, after discovering you on some routine Vashon Google research. (We’re considering moving there from West Seattle.) Every post urges me to take the leap across the pond! That 20 minute ferry ride is like going to Paradise! And you can drive to the other Paradise in about 90 minutes! Ha! Don’t I know it. Most of my friends already think West Seattle is Patagonia – something about driving over a bridge does strange things to perceptions of time and space. I can imagine the addition of a ferry ride would just be too much for many of them. My fiance and I both grew up in more rural areas (Chehalis for me; Oklahoma for him). I like the idea of a quiet island with such easy access to the city. And, as the parents of four young children, we’re drawn by the schools and the greater space for romping. Kellee, Vashon schools are excellent according to all my friends with school-age kids. It’s a great place for families, nature’s out your front door and Puget Sound is out your back. 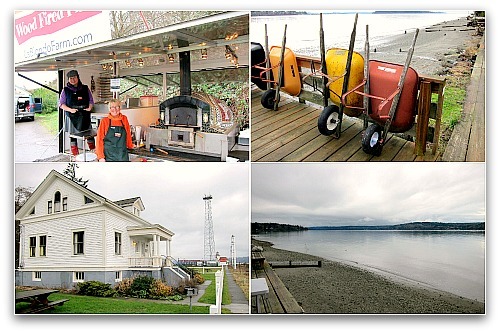 Vashon is a great place to be kid, and a geezer for that matter. Good luck, let me know if I can help you in any way. Love the Mayan Gold! This has been the grayest winter I can remember so color is good! Amen, Brother! Like the Mayan Gold color, might consider it to cover up some of those ubiquitous white walls in my house. “Rhizomatic rebar” – I love it! Perfect description of the Himalayan blackberries creeping into my yard. Happy, HAPPPPPPPY BIRTHDAY to you, Tom. Best wishes for the coming spring and summer. May your fruit and vegies grow in abundance and your water tanks filled to the brim. Good luck with the greenhouse :-). Happy B-day Tom! I am interested in your greenhouse project, I may do one here in Lebanon too. Signs of Spring here, trees in blossom. Exciting! Joumana, I’m intrigued by those acorns, do you know their Latin name so I could locate some to plant here? And thanks for the Birthday wishes and I’ll be sharing my greenhouse progress as it appears. 😉 Which hopefully will be soon. It’s snowing AGAIN in Massachusetts. No snowdrops for us, believe me! So your post brought gladness to my heart. 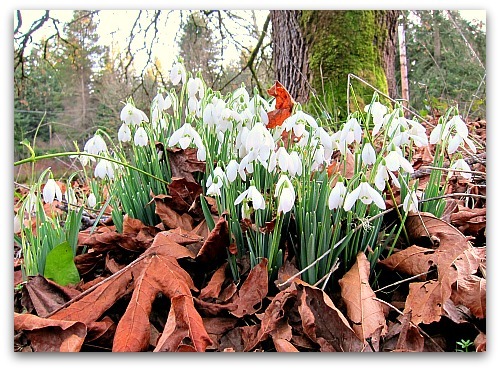 Ah, snowdrops and crocus! I can’t wait for my own! Looks like you had a winter full of good experiences. I don’t suppose you saved some pastry for me? Yes, we’re all ready for spring! My projects? Raised garden beds (to keep out rabbits and my Frenchie), and a harvest table for the patio (table base made from piping). 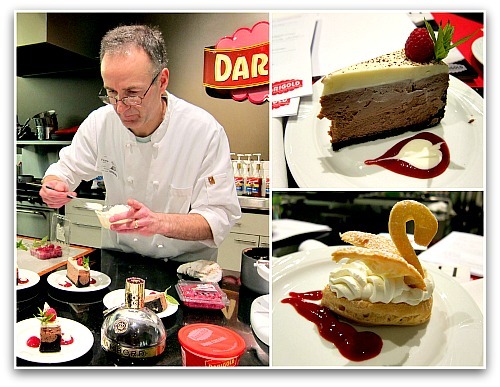 Also, looking forward to recipes from your pastry class!! The big sign of Spring in my back yard are happy honeybees bringing pollen back to their hive! My horrible 20% success rate in keeping five colonies alive over the winter has prompted me to revise my beekeeping skills (skills?). I can hardly wait for the garden to be filled with thousands of happy bees. Tom, you should start an apiary! Margaret, I would love to come see your hives sometime. I too had difficulty keeping bees for the last six years, but am willing to start over and try again. Yay for those wonderful signs of spring! Here in Virginia, my snowdrops are not as far along as yours. 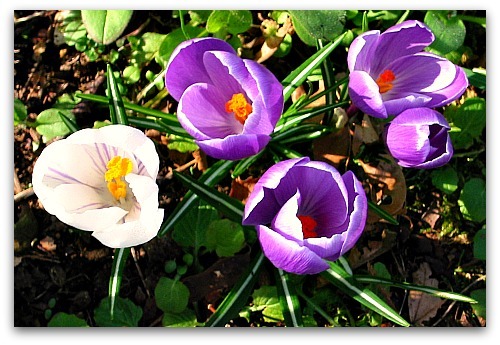 Now I have to go peek for signs of the crocus. Amen! Happy belated birthday, sorry I missed any reference to it earlier. Here in North Louisiana, we have daffodils, paperwhites, maples, and red oaks blooming now. The elms already have seed! Seems too early for sure, so we are waiting for the other shoe to drop. My dear hubby Lewis built me a greenhouse last fall. Many salvaged materials that had been collected for the last fifteen years were used. 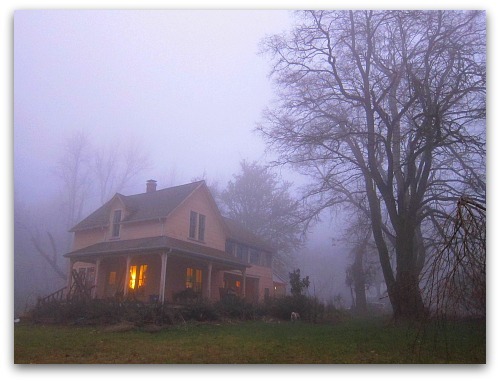 It is a cool house with only thermostatically controlled electric heaters for the coldest nights. The citrus trees dont’t mind the cool temps and have many flower buds showing. The hibiscus is less happy: still green, but not blooming. Many geranium flowers as they tolerate a lot more cold than you would think. I planted my tomato and pepper seeds today and the temp in the greenhouse was near eighty. Good luck with your hoop house: I’m sure you will really enjoy it. Regards fromCarol and Lewis. Tom, we do have muscadines and I have planted some kiwis as well. The muscadines were plentiful last year and much pepper jelly was made! The kiwis are too young to bear. Tomatoes do well if you have full sun. I keep everything that goes in the greenhouse in pots as it will be too hot in the summer. Good luck with your house. Happy Birthday Tom! 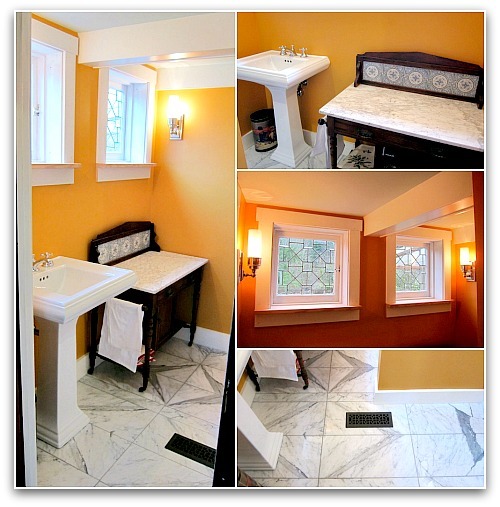 Love the bathroom…can’t wait to hear about your greenhouse project! How is the Midwest treating you otherwise? Happy Birthday Tom – looks like it was exceptional! During my first year in the Pacific Northwest, as a transplanted Northerner I couldn’t believe that spring actually arrived by the official date of March 21. To be honest, 12 years later it still amazes me. I can’t wait to witness it again. Three more weeks and once again, I’ll be an Oregonian. Happy Day! June I’m eager to hear about the move when it happens and can’t wait for the new recipes from the Oregon Coast! Wonderful — Amen, brother!! What a lovely post! Amen, indeed! I want it to be spring very much too! So much fog! A grand post! 🙂 I love your interior decorating skills a lot! You can come over & paint our interior in our house. We need to do that soon,…! I’ll give you an amen! Hee hee hee. But I agree… out here in the east the weather’s been dismal – constant on-and-off days of snow and bitter cold. You just know it’s bad when the pups speed up during their walks! “rhizomatic rebar”. You’re killin’ me! Tom, it appears to me that the dogs have started a “princess & the pea” gig whereas you keep putting bed on beds in order to make them more comfortable. A belated Happy Birthday to you! So pleased you are part of our wacky island.